The software can take into account a wide range of effects acting on the pulses, including wavelength-dependent and/or saturable gain and losses, chromatic dispersion of arbitrary orders, and a wide range of optical nonlinearities. It is possible, for example, to simulate pulse shaping in mode-locked lasers or supercontinuum generation in photonic crystal fibers. Via the intuitive interactive pulse display form, you can easily check all kinds of pulse properties at different locations, in a mode-locked laser for example, varying the number of resonator round trips. Also, you can display spectrograms and Wigner plots. 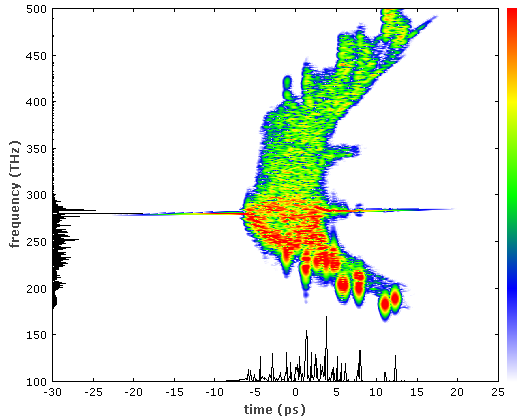 Pictured: Intense chirped picosecond pulses at 1064 nm (282 THz) propagate in a fiber and generate a supercontinuum. At low frequencies, where the fiber dispersion is anomalous, several solitons can be recognized, which interact with high frequency components having the same group velocity. Low and high frequency components are delayed due to group velocity dispersion in the fiber. The temporal wings of the initial pulses are not yet converted for the given fiber length (see the narrowband structure at 282 THz). Due to the powerful script language, the software is enormously flexible. You will hardly find this flexibility in any competing product. High speed calculations: RP ProPulse is optimized not only for convenience, but very much for high speed calculation speeds. This optimization is achieved using a combination of measures, including an ingenious design of the general concept/data structures, and also optimized algorithms. Users are often amazed when the observe how fast this software really is. Clear, intuitive graphical simulation outputs allow the user to observe pulse changes as they evolve, both temporally and spectrally. The temporal evolution of a third-order soliton. This animated GIF file has been prepared directly with RP ProPulse (without using additional software). Click the image to enlarge. 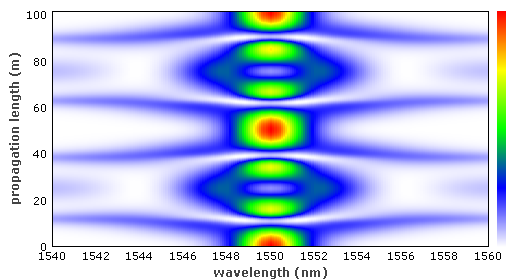 A spectral-evolution graph corresponding to the time-evolution of a third-order soliton. The software comes with comprehensive documentation in the form of a detailed PDF manual, explaining not only the handling of the software, but also the mathematical representation of pulses and similar important details. Competent technical support is included in the license fee, and the support can also be used for general technical consultancy on pulse generation and propagation. 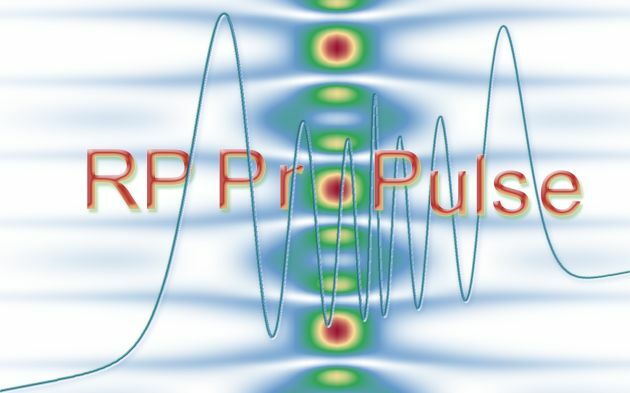 RP ProPulse is an essential software too, whether you develop mode-locked lasers, parametric oscillators, or fiber-based devices for spectral broadening of pulses. Users benefit from the world-renowned experience of RP Photonics in the area of detailed pulse simulations and obtain a deep understanding of their system without massive trial and error efforts! See also the comprehensive description of the RP ProPulse design software on the website of RP Photonics, the producer.